When we first visited Bangkok many years ago, Chote Chitr, which is now firmly planted on the tourist trail, was our go to- the crunchy banana blossom salad and the thick, spicy red duck curry was the stuff of dreams. The food is still good but we were eventually put off by the fearsome proprietress who would glare at you throughout your meal and shout at the chef- an old grandma figure- it just wasn’t fun anymore. Enter Krua Sam Hom, a nondescript space (we had to ask which shop it was, as there is no visible signage) with a few tables and a grandma that knows how to cook. TBS crowned our meal here, the best he’d eaten during our time in Bangkok. A big call. 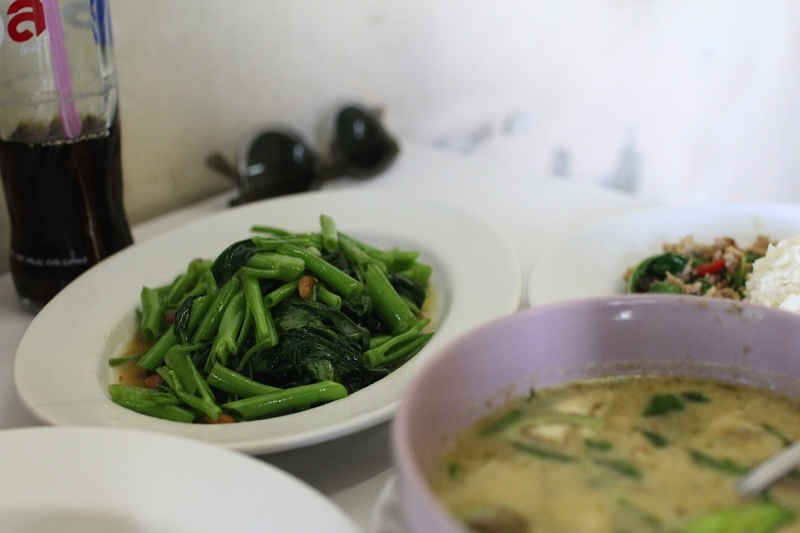 We kept it really simple, ordering a green chicken curry, stir-fried morning glory and a pad kra pao with minced pork. 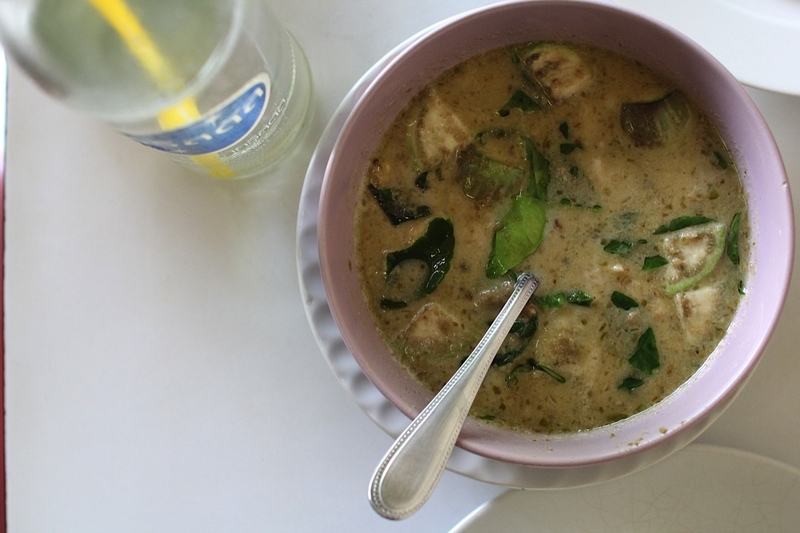 The green curry was quite soup like- the bright, fresh flavours of lemongrass, kaffir lime and basil wafted from the bowl and we found the Thai eggplant tender but with a hint of bite. The sauce was so addictive that I slurped spoon after spoon of it long after all the chicken and vegetables had been picked out. 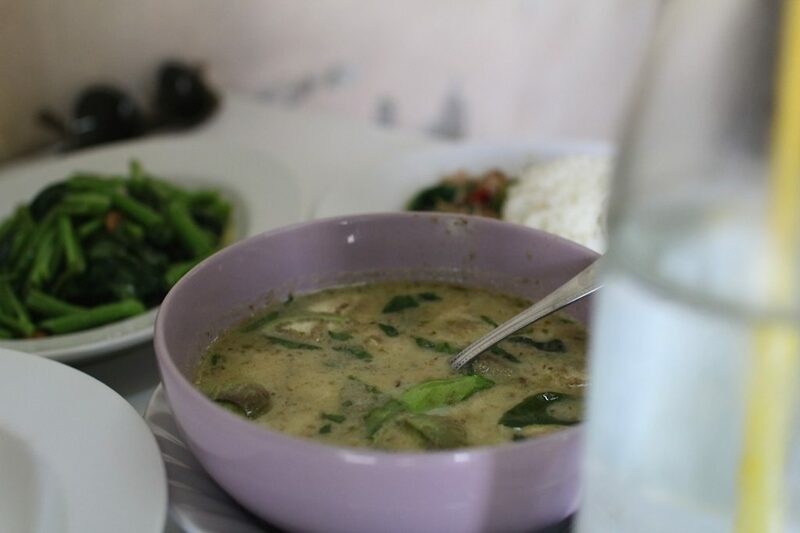 It was creamy, spicy and full of those Thai flavours you yearn for as soon as you step back onto home soil. The stir-fried morning glory was crunchy and redolent with the scent and taste of garlic. We can’t get enough of this simple dish when we’re in the land of smiles. It was hard to wrestle the pad kra pao off TBS- the perfect harmony between the sauce, the fragrant holy basil and the tongue searing chillies was perfection. 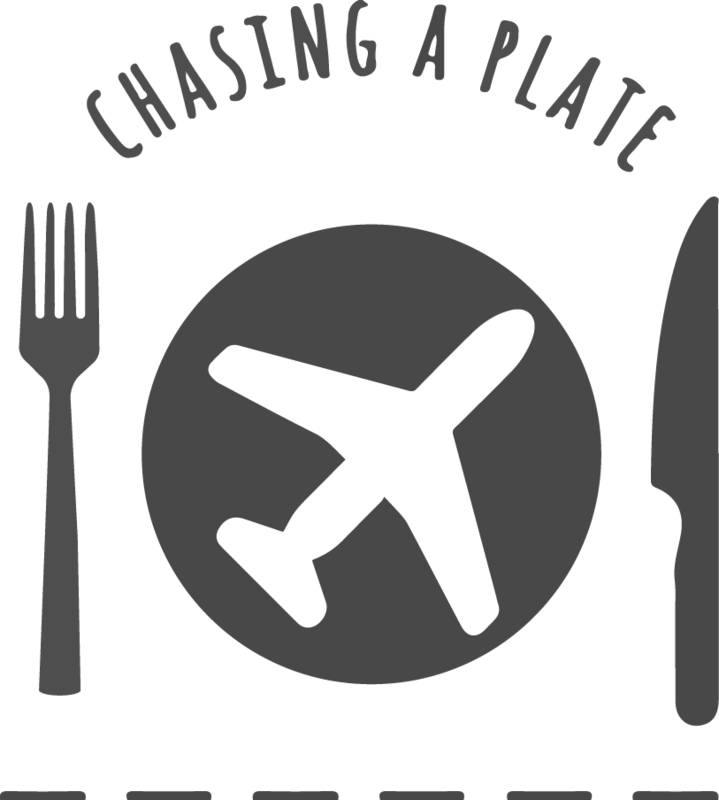 It’s a humble spot and you’re likely to be the only diners, but don’t let that put you off. 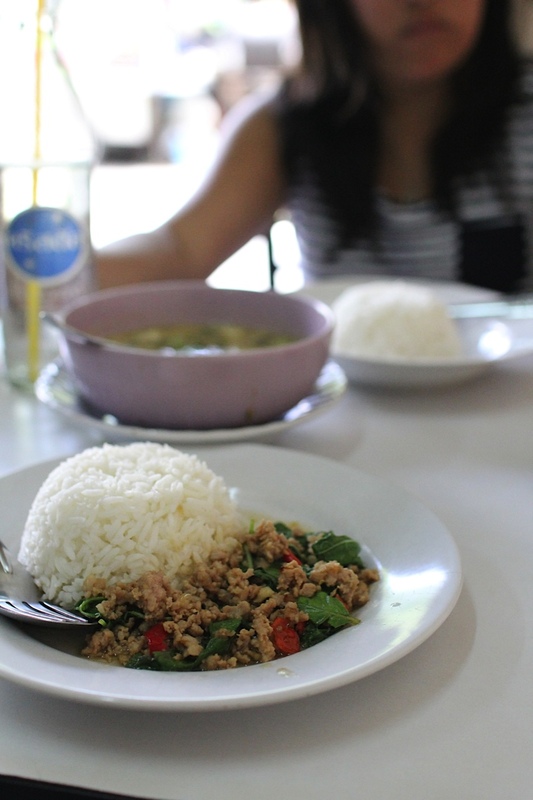 Out of this small kitchen comes some of the most comforting and tasty examples of Thai cooking you’re likely to encounter on your trip. Don’t be fools like us and go on your last day for you’re bound to want to return. And if you’re after something to lick away the heat from those chillies, don’t neglect to head to Nuttaporn for some of Bangkok’s finest ice-cream- it’s just around the corner. Getting around Bangkok can be tricky. 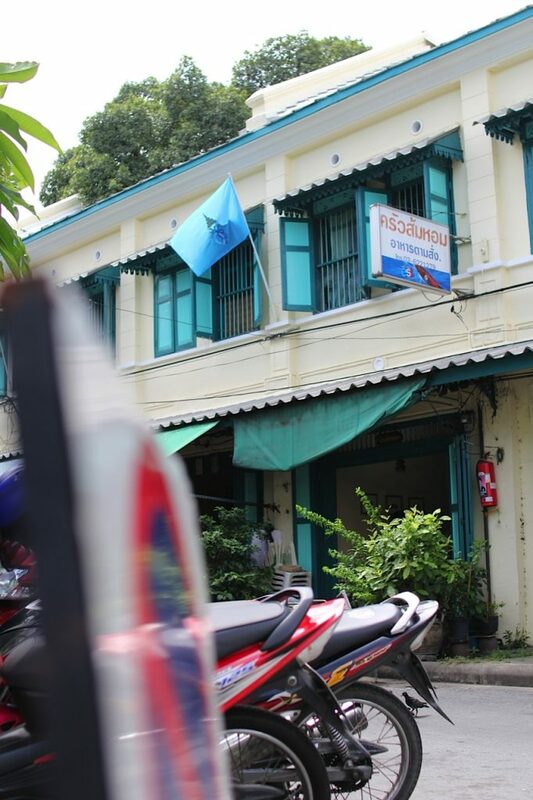 We found Krua Sam Hom by heading to the eastern end of Khao San Road. Walk south along Tanao Road for 650 metres (about 8 minutes). On your right you will see Phraeng Nara Road, carry on down Tanao Road for about 50 metres and turn right down Phraeng Puthon. Continue down Phraeng Puthon (100 metres) until you hit the square. The restaurant is opposite the square on the right hand side. There is an arrow painted on the road in front of the restaurant.